A new Javelin track that’s like a spaced-out New York city brand of reggaetón — but not nearly as annoying as music in that subgenre can often be. 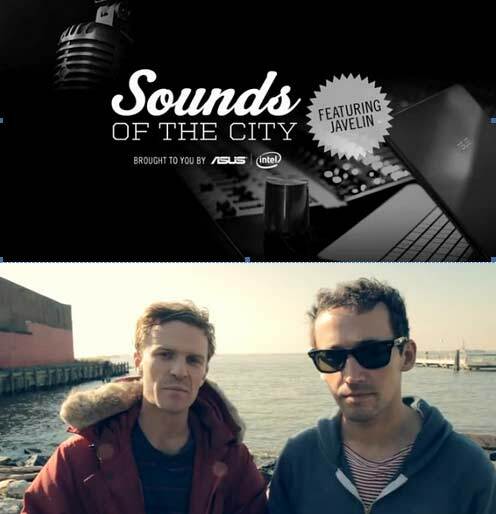 The sound uses sounds sampled from around the Red Hook neighborhood of Brooklyn, and I guess it’s for a PureVolume-related music series brought to you strangely by ASUS — a computer hardware company — and Intel. Everyone’s trying to get a bit of the musical pie. See videos of Javelin recording the track on PureVolume. I… think? They were probably happier to make this than they look like they are? Hopefully…?